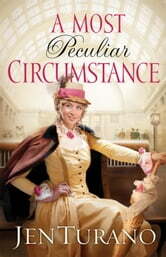 Miss Arabella Beckett has one driving passion: to help the downtrodden women of America. Naturally, she supports the women's suffrage movement and eagerly attends rallies and lectures across the country. On her travels, she makes a simple offer of assistance to a young woman in need that goes sadly awry and lands both ladies in more trouble than they can manage. An independent sort, Arabella is loath to admit she needs help and certainly doesn't need help from an arrogant, narrow-minded knight in shining armor. Mr. Theodore Wilder, private investigator extraordinaire, is on a mission. A mission that began as a favor to his good friend Hamilton Beckett, but swiftly evolved into a merry chase across the country. By the time he finally tracks down Hamilton's sister, Arabella, he is in a less than pleasant mood. When the lady turns out to have radical ideas and a fiercely independent streak, he soon finds himself at his wit's end. When they return home to New York, circumstances force their paths to continue to cross, but the most peculiar feelings growing between them certainly can't be love. When the trouble Arabella had accidentally stirred up seems to have followed her to New York and threatens her very life, the unlikely couple must face the possibility that they might have landed in the most peculiar circumstance of all: love.